For the first time, a fleet of tall ships will sail and race their way along the Gulf Coast to participate in the TALL SHIPS CHALLENGE® Gulf Coast 2018 series with public maritime festivals held in each port. Kicking off this new event, Galveston Island will play host to the 2018 challenge from April 5-8, 2018. Get your tickets now for this exciting new Gulf Coast maritime event! GROUP TICKETS – We are happy to extend special discounts to your group of 20 or more. Interested? Contact Alyson Whitaker at 409-765-3432 or alyson.whitaker@galvestonhistory.org for more information. The festival will be open April 6-8, 2018 from 10 a.m. to 9 p.m. daily for ship tours (onboard tours available from 10 a.m. to 5 p.m.), live music, vendors, and more. Held at 7 p.m. on Friday, April 6; Saturday, April 7 and Sunday, April 8. Toast the ending of the day and beginning of the evening with tickets to our special Salute to Sunset party. 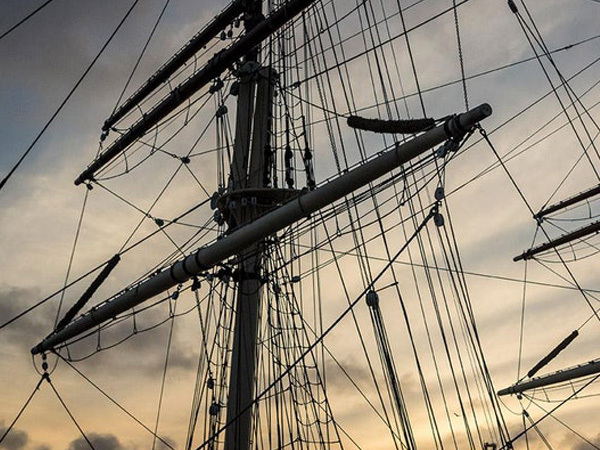 Ticket holders will enjoy access to tour one of the participating tall ships after daytime tours conclude, complimentary craft beer, light hor d’oeuvres, and an unmatched setting at the Texas Seaport Museum. Tickets do not include festival admission. Held throughout the day on Friday, April 6; Saturday, April 7 and Sunday, April 8. See the visiting fleet from a totally different angle! 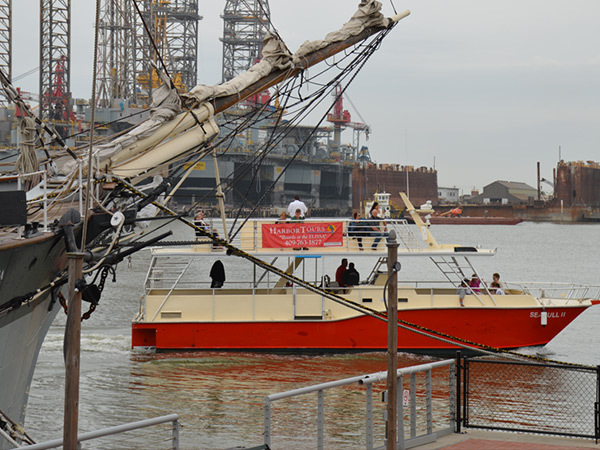 Galveston Historical Foundation’s Seagull II will take tours of the Galveston Harbor to show off its rich history and offer guests waterside views of the ships. Learn more about the histories of our visiting fleet, and view dolphins as you travel through the bay. Tickets do not include festival admission. Your presence is requested for an evening of drinks, food and more at our exclusive Captain’s Table night. 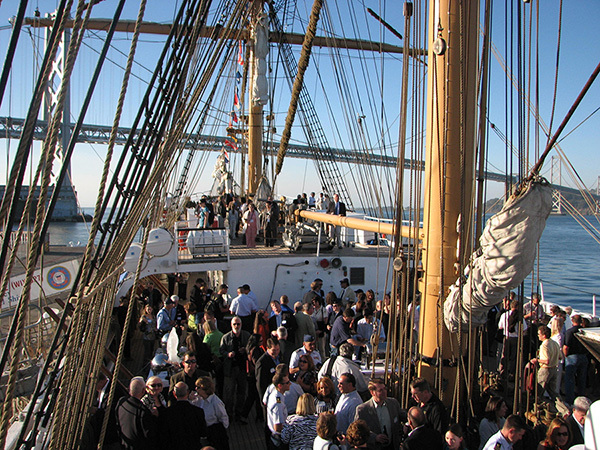 Enjoy dining with the captains of our festival Tall Ships, live music, an exciting live auction featuring original works of art from regional artists, private access onboard one of our visiting Tall Ships, open bar and much more. I’m wondering where would be the vantage point and when would be the best time to see and possibly photograph the ships under sail. Thank you. 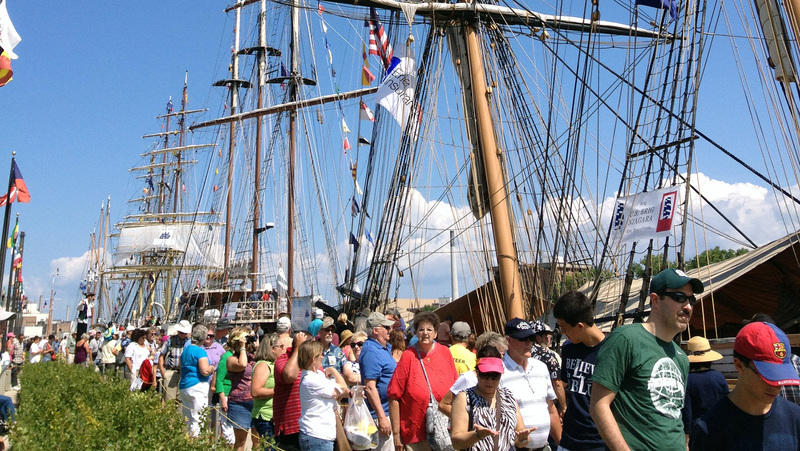 Please visit http://52.15.118.96/events/tallships/parade-of-sail for more information on the Parade of Sail. Hi. I’m wondering If the ticket that’s available for purchase online is for the Festival + Ship tour or just the Festival Admission only? Both are available. You will have the option to select which type of ticket you want at checkout. Is the Festival dog-on-leash friendly? Pets are not allowed in the festival grounds. Is there a place to check for cancellations for a sail? No tickets have been available for a while and my 7 year old grandson would love that for his birthday! I’d encourage you to visit our social media page for any openings. We do not have any at this time and don’t expect to have any. is the Captain tables seating on board one of the Tall Ships? The Captain’s Table is not onboard a ship but does give private access onboard the Oliver Hazard Perry. Also, our Salute to Sunset parties are held nightly and offer a different ship each night and beer and appetizers at dusk. Does the Plankowner’s ticket include admission to go on the ships or just the dinner? 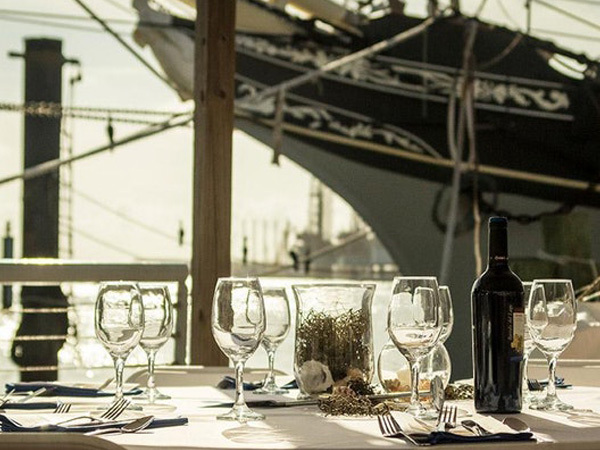 Your Plankowners’ reservation includes festival ground admission for Saturday, dinner reservations as well as private access to the Oliver Hazard Perry after dinner. Is this event stroller friendly? If so would you recommend the use of one? Strollers are allowed on the piers and event sites. Strollers are not allowed on the ships, but there will be space on the piers for strollers next to ship gangways. Placement of strollers is based on the honor system. There is no specific parking area for strollers. 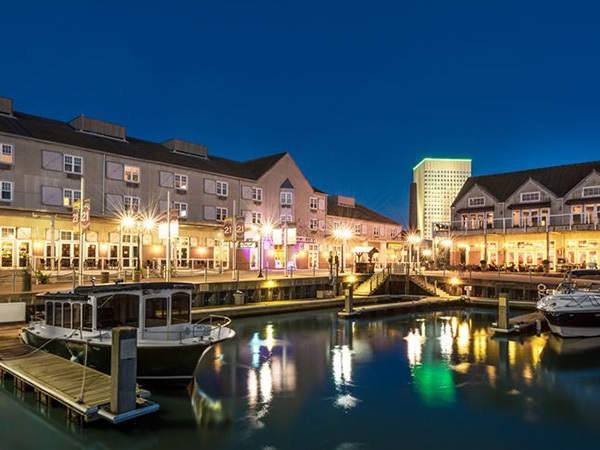 The address for the Plankowners Dinner is 2000 Harborside. Is this the old Joe Crab Shack restaurant? Plankowners will be held in the lot on the corner of 20th and Harborside. It’s the parking lot in front of the old Joes. There will be a large tent and signage. How much are kid tickets for the sunset tour? $35 per person (any age) – tickets at https://www.eventbrite.com/e/twilight-harbor-ship-viewing-tour-tall-ships-galveston-tickets-44259784206.